During my visit in Manchester, PA, I met with teachers in grades 4-6 in Northeastern School District to study literacy work stations. We delved deeply into the differences between stations and centers to find out how to more effectively involve students in meaningful independent practice that they take responsibility for (rather than us doing all the work). 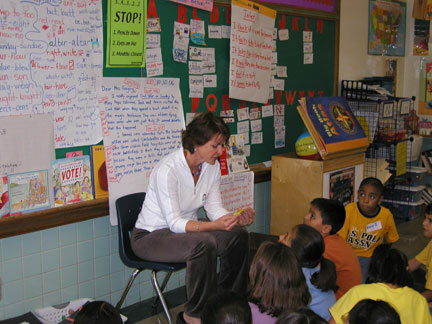 Teachers here have done book studies with Practice with Purpose and are eager to implement what they have learned. I shared with them the importance of having reflection as part of our instructional day, and we looked at the Sharing Time cards in the Appendix on page 164 in Practice with Purpose. When I showed teachers the cards I created to remind us to have sharing time for 5 minutes each day, one of the principals piped up, “Your cards are orange and black—just like our school colors!” He also confessed that he owns orange sneakers! By the way, the schools were having a spirit contest while I was there, and most everyone was garbed in these colors. Hence, the strong connection. 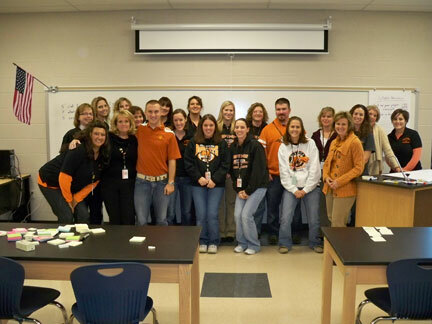 Just for fun, here’s a picture of us enjoying learning together—in orange and black! I didn’t even know to wear orange that day, but fit right in!